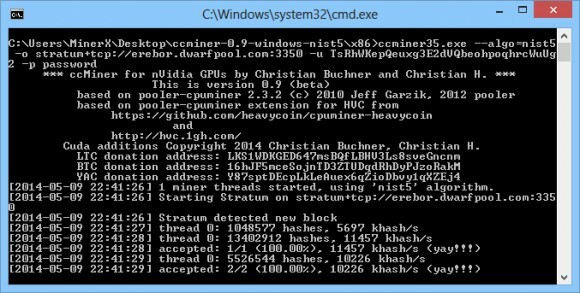 The ccMiner software miner for Nvidia GPUs has received an update of the source code to add support for the NIST5 algorithm and the Talkcoin (TAC) crypto. We have compiled a binary for Windows that you can find below, it is essentially the fully functional 0.9 release with the added support for NIST5 algorithm. Do note that NIST5 is apparently faster on Nvidia GPUs for the moment as we are getting about 11 MHS in terms of hashrate on a GeForce GTX 780 Ti, so significantly better than what the AMD miner for NIST 5 is currently capable of. Do note that the windows binary you can download below is compiled for Computer 3.0, 3.5 and 5.0 cards (32-bit version only), so it will not work on older cards. It is also compiled with Visual Studio 2012, so if you do not already have Visual C++ Redistributable for Visual Studio 2012 you will have to download and install it. The ccMiner software miner for Nvidia GPUs has received an update of the source code to version 0.9. The update adds some performance improvements in terms of hashrate for Jackpotcoin (JPC) as well as adding support for two new crypto currencies – Quarkcoin and Animecoin. We have compiled a windows binary from the latest source and you can download it below. Do note that the windows binary you can download below is compiled for Computer 3.0, 3.5 and 5.0 cards (32-bit version only), so it will not work on older cards. It is also compiled with Visual Studio 2012, so if you do not already have Visual C++ Redistributable for Visual Studio 2012 you will have to download and install it. 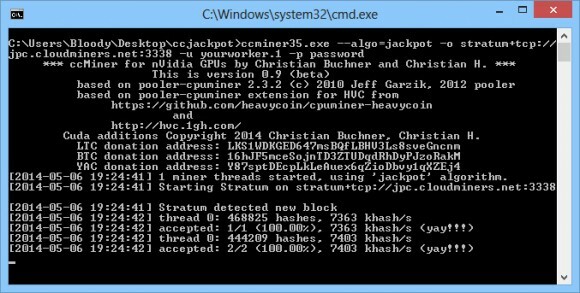 If you want to compile the miner from the latest source code yourself you can take a look at our guide for compiling CudaMiner as it will work out just fine for compiling ccMiner as well.